12.5" RCOS @ ~f/9 (2880 mm fl) 0.64 arcsec / pixel. The Zoomify image scale is 0.64 to 2.05 arcsec / pixel. eXcalibrator for (u-g), (g-r) color calibration, using 32 stars from the SDSS-DR7 database. PhotoShop for non-linear stretching, LLRGB combine. 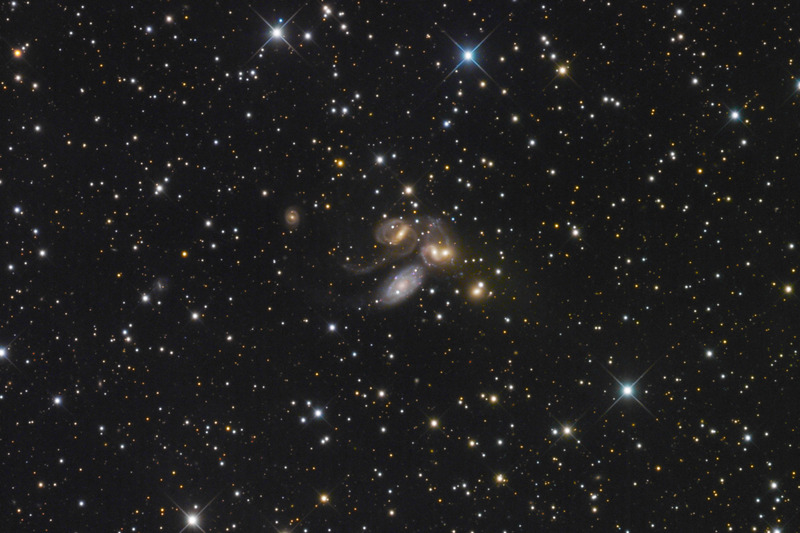 Stephan's Quintet (aka Hickson 92 and Arp 319) was discovered by E. M. Stephan, in 1877. The galaxy group is located in the constellation Pegasus, at a distance of about 250 to 300 million light-years. In 1961, Geoffrey and Margaret Burbidge discovered that the redshift of NGC 7320 is far less than the other four galaxies. This reduces the group to a quartet. However, NGC 7320c's redshift is similar to the group and including it restores the status to a quintet. Stephan's Quintet has been at the center of the redshift controversy. It was thought that NGC 7320's tidal tail is clear evidence of interaction with the other four galaxies, proving that its much smaller redshift was invalid. However, with a wider field of view, NGC 7320's tidal tail is noticeably curving toward the nearby galaxy NGC 7331. NGC 7331 is at 46 million light-years and NGC 7320 is at 52 million. 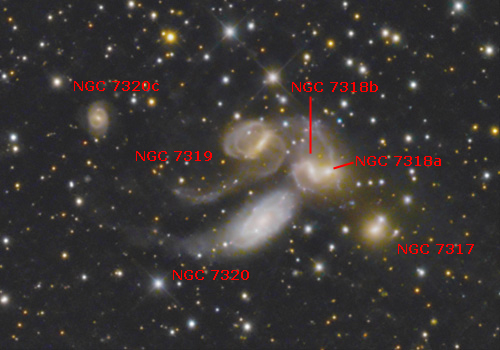 This suggests that NGC 7320 is a member of the Deer Lick Group. The redshift controversy faded in the late 1970s and early 80s. Today, redshift is accepted as a valid method for determining distance. However, there are still a few non-believers. Click here for an article that uses Stephan's Quintet to disprove the theory of redshift. Click here for a more general article about the redshift controversy.